Roll Adapter to fit 2.25" (60mm) di..
2-ply. 300 metres per roll. 60mm Core..
2-ply. 300 metres per roll. 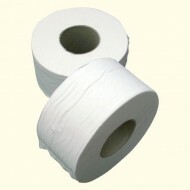 80mm Core..
Dispenser for 2-ply Mini Jumbo Rolls, 2.25" (..
2-ply. 150 metres per roll 2.25" (60mm)&..
2-ply. 150 metres per roll 3" (80mm)&nbs..